Welcome to my fine art site. Here you’ll find galleries showing my watercolor and sumi work. In the past few years I’ve focused my painting on close up views of plant life that I call Floralscapes as they take the viewer into a new abstracted world, an immersion into color and design depths while retaining the realism of the bloom. I paint in both a planned and strategic way, as in the flower paintings, as well as intuitively and directly from the figure at life drawing sessions, achieving quite different results. I’ve exhibited my figure work a lot as they have a distinctive look and sensuous appeal in the way the watercolor takes the shape of the figure in and out of the surrounding white space. As I’ve studied sumi-e techniques, I’ve taken on the challenge of painting the figure and subjects in nature using minimal strokes to express the subject and I’ve found an audience for these distinctive works. Teaching watercolor since 2008 at Bellevue College renewed my interest in more developed and layered paintings as I guided my students through the process. Here’s a video interview of me describing my work in the Seattle Realist Artists show in October and November 2016. In 2012 I qualified to become a signature member of the Northwest Watercolor Society and the NWWS initials now follow my signature on recent watercolor paintings. Summer 2015 I was the poster artist for the Bainbridge in Bloom garden tour on Bainbridge Island, WA, just a short ferry ride from Seattle. Now I live on Bainbridge Island! 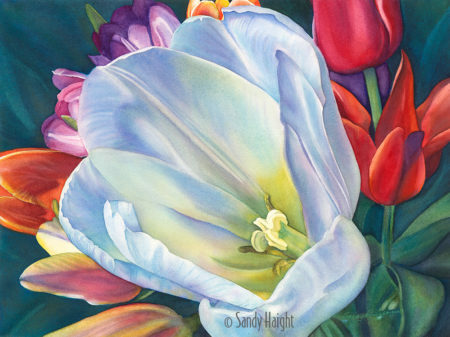 In 2016 I was the poster artist for the Skagit County Tulip Festival in Washington, a huge honor and fitting opportunity to celebrate my interest in painting flowers. The poster art won a gold award from the International Festivals & Events Association. Contact me for exhibition prospects or for information on availability or purchase of the artwork on this site. Floralscape images are available as archival giclees on canvas and watercolor or matte paper or on canvas. Some are available in the Etsy shop viewed on this site!